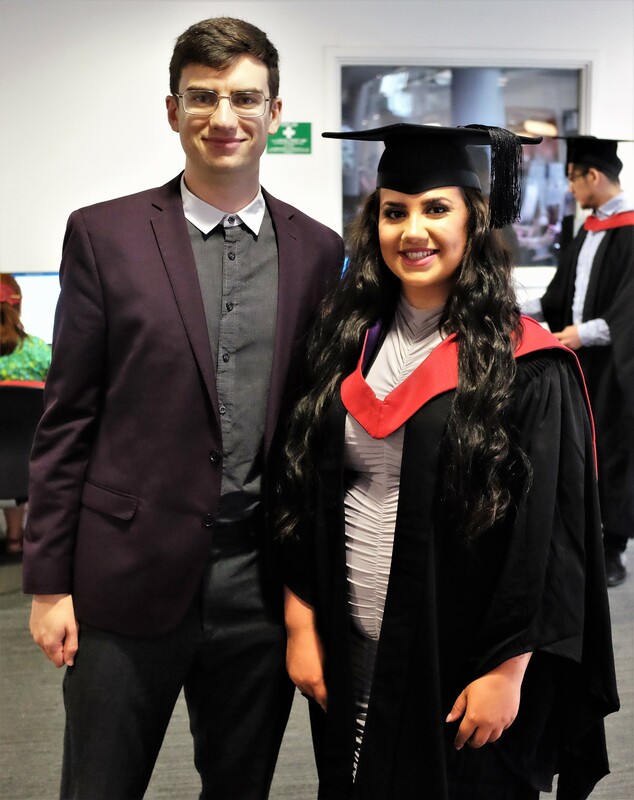 Tuesday 11th September 2018 was such an incredible day that filled me with an overwhelming amount of pride and joy; I got to see my partner’s sister, who I first met just before her 13th birthday, graduate with a 1st Class Honours in FRTV & Drama from CCCU. It’s not my place to tell her story but I think she’d agree it was a hell of a rollercoaster and making it into that cathedral was a long road so seeing her not only graduate but with such extraordinary grades absolutely blew me away. After wandering around Canterbury for the day, from one location to the other, we spent some time unwinding before heading to The Vineyard in Wrotham. In fact, I valued the day so much and knew the restaurant was slightly on the fancier side that I wanted to feel comfortable and fresh by switching up my outfit (apart from on a cruise, I’ve never worn two outfits during a day event). To allow for a more relaxed evening we got a taxi to and from The Vineyard with Express Cabs and, as somebody that used to work in the taxi/chauffeur industry, was delighted when both journeys had relatively new Mercedes-Benz Viano’s (though the second one had the less sophisticated layout of all the seats facing forward instead of towards each other). The appearance of the restaurant, with its traditional cottage feeling from the outside, was very traditional and classy on the inside. Walking through the main entrance, a couple of standard sized doors with a small porch in between, we were greeted by a very friendly staff member that asked if we would like to sit at the bar with drinks and look at the menu or head straight to our table. On choosing to sit in the bar area the provided a bowl of large green pitted olives and also one of peanuts for us to nibble on whilst selecting our food and sipping away at our first drinks of the evening. 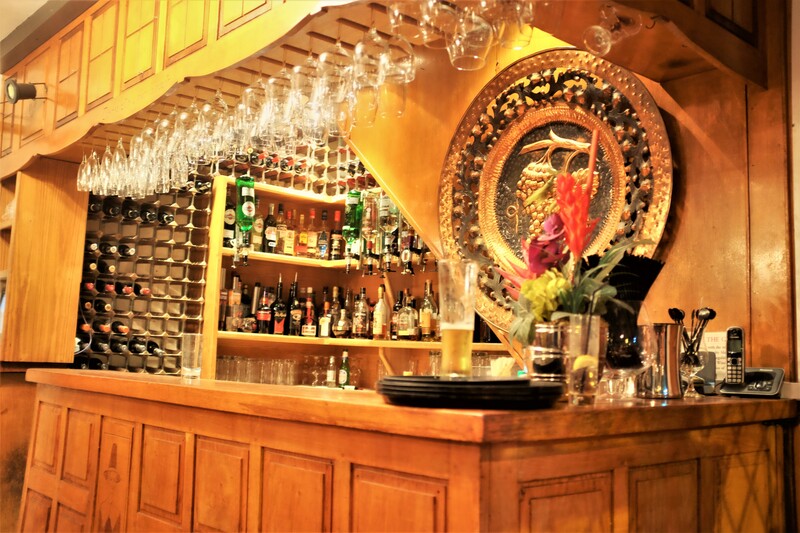 It’s refreshing to encounter a restaurant that is chilled out enough to let you sit at the bar in a more relaxed style, even place your order from the menu, before heading off to the formal dining room. Not only does it improve your experience as a dinner arriving but also helps to stop the eating area being a place of hustle and bustle for other diners already seated at a table. As well as getting greeted by a friendly face and positive attitude we also encountered a warming and traditional style bar with wooden panels, glasses hanging from the ceiling and alcohol bottles neatly placed on display in the background instead of getting covered up. To add a touch of personality to the bar, and connecting it to The Vineyard name, they had a large metal plate on the slanted wall, covering up the stairs behind it, with a grape design that fitted in well with the existing colour scheme but gave it an added layer of design and helped to break up the wooden panels a little bit. Where the day was so hectic and on the go sensible food eating sort of went out of the window so by the evening I was certainly ready to sit down and enjoy a meal. Despite the desire to eat food I wasn’t at the point of being so hungry that anything would do or beyond the point of eating; I was ready and excited for food but could have waited a little while longer if needs be. The menu was lengthy and full of a number of delightful items that left us all contemplating between having this or that for a little while. Eventually I managed to reach a decision and went with the avocado and mushroom for starter. 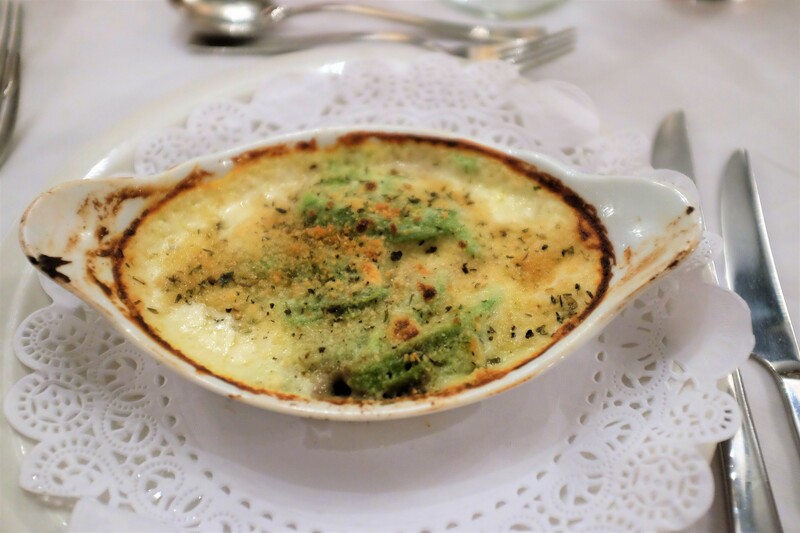 It’s a lot more complex than you might imagine it would be as it was sliced avocado with a large mushroom underneath served with béchamel sauce, topped with stilton cheese and baked in the the oven. There is something about the dish that sounds a little unusual and I think it’s linked to the way that we normally have avocado cold and perhaps just on top or on the side of a hot dish but it isn’t usually within the heat itself but it really worked. The combination of all the flavours and ingredients made it wonderfully creamy in both taste and texture whilst also having a lovely depth of blue cheese and herby flavours to compliment the natural avocado and mushroom flavours and to offset the richness of the béchamel sauce. This is a dish that I would go for again in the future if I spotted it on the menu and nothing new was shouting out to me and if I was feeling fancy and happened to be hosting a dinner party even something I would attempt to recreate myself. After a short pause the main meals were brought to the table, after various glasses and cutlery that was no longer needed was removed from the table, this included all the main dishes and the various sides of vegetables and sauteed potatoes that we had opted for on the side. As always when you have vegetables to share we all went for a smaller amount on our plates to begin with and then at the end of the meal I ate a huge amount of additional veg just to feel more nutritionally satisfied (it worked). There were so many main dishes that I hadn’t tried in the past but they at least contained a main ingredient, a type of meat or fish, that I had experienced before. Feeling on the brave side though, and wanting to try something new given how the day was about creating wonderful memories and sharing a fantastic moment, I decided to try out the veal medallion dish. 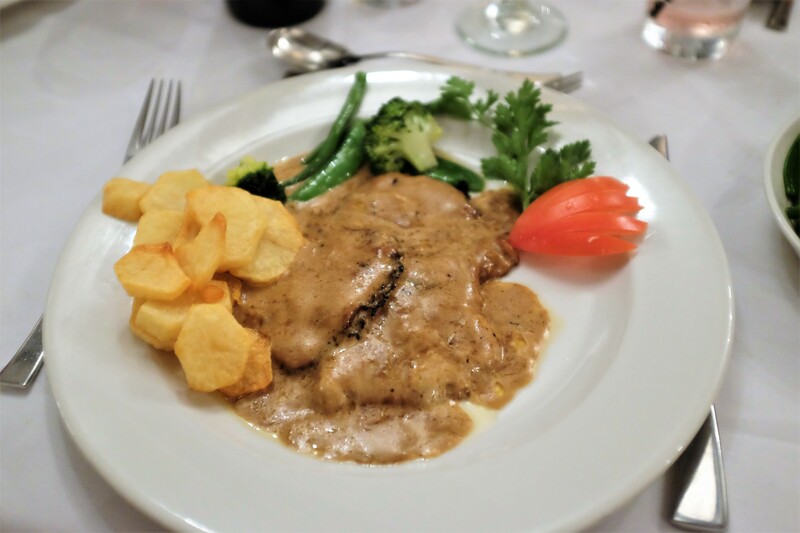 Veal is something that I have never eaten before but have heard great things about it, especially in medallion form where it is so thin, and it was absolutely divine as the meat just melted in the mouth. 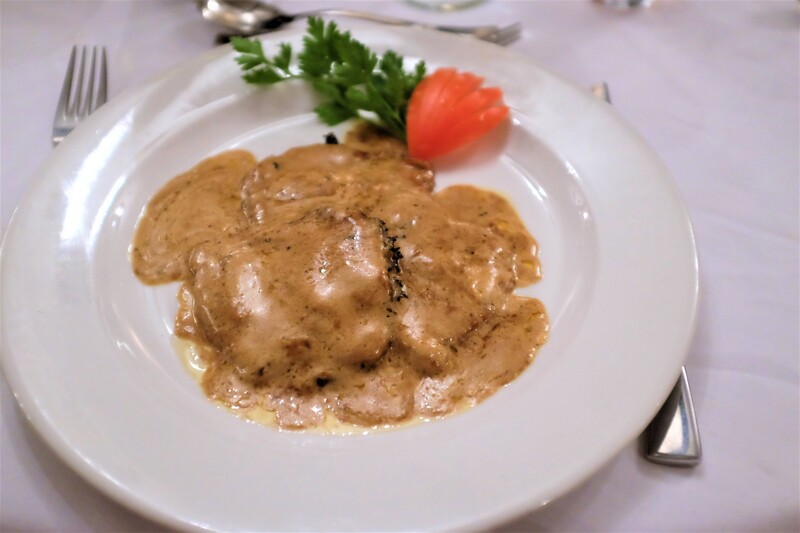 The sauce was a creamy marsala sauce which provided an added depth and velvet feel to the meat but complimented it well without overpowering the gentle softness of the veal. The potatoes were so crispy and well cooked as well that it made me wish I could successfully cook all my potatoes like that at home and the vegetables were cooked to a good level of not being crunchy but not reaching that point of mushy either. This is a dish that I wish I could each everyday of the week and it is something that has encouraged me to consider veal and veal based dishes in the future. The meal, atmosphere and restaurant was really wonderful. Perhaps it felt even more wonderful than other restaurants because of the celebratory feel and special day that was connected to it. I can’t quite describe, however many times I try, just how proud I am of her, how much of an honour it was to be able to enjoy the day with her and to be there as her life changes from student to mama-to-be. Would highly recommend the restaurant as the food is great, the decor is wonderful and the staff are super friendly and thoughtful as well. This entry was posted in Food and Drink, Restaurant Reviews and tagged bar, celebration meal, dinner, dinner out, food, food blog, food blogger, food bloggers, lblog, lblogger, lbloggers, life, Lifestyle, lifestyle blog, lifestyle blogger, lifestyle bloggers, main, meal, meal out, meat, night out, restaurant, Restaurant review, review, starter, veal, vegetarian. Bookmark the permalink.